Too much petrol and a lighter flicked at the wrong time nearly turned a protest by India’s Congress Party activists into a mass self-immolation. The shocking incident occurred during a ritual protest burning of an effigy of Prime Minister Narendra Modi. 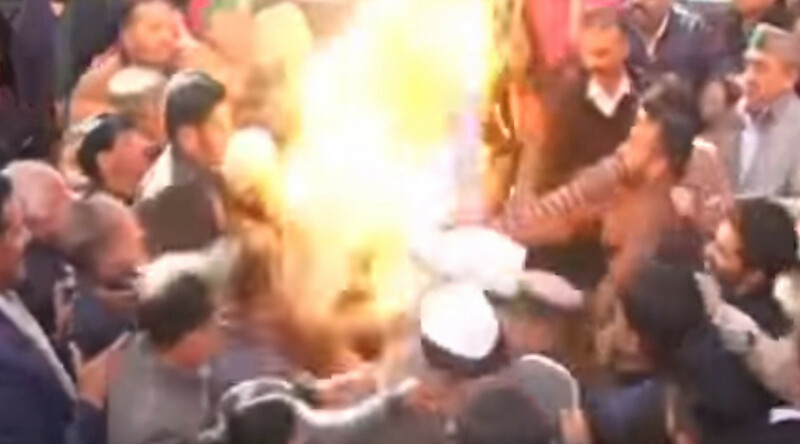 At least three Congress Party protesters sustained serious burns after their attempt to burn Modi’s effigy in Shimla, the capital of the northern Indian state of Himachal Pradesh, literally backfired. Some of the injured were taken to the hospital in critical condition. The demonstrators, who were carrying banners with anti-Modi slogans, were protesting over the controversial National Herald fraud case, which allegedly involves key Congress figures Sonia and Rahul Gandhi and which the opposition has branded a “political vendetta.” The ruling Hindu nationalist BJP, (Bharatiya Janata Party), however, rejects the accusations, saying that the case was launched in 2012, some two years before Modi became prime minister. Three protesters sustained injuries in the incident, he said.